What are the Best Rocking Chairs for the Porch? My favorite outdoor front porch rockers! In my opinion, a good rocking chair is one of the best front porch piece of furniture a home can have! But which one is the best rocking chair for your porch? There are many kinds of outdoor rockers: wooden ones, steel, plastic, wicker, synthetic wood, so on and so forth. I really like the wood rockers! They are very rustic looking and just perfect for a country home! You won’t have as many options color wise, of course. *This one in the picture, for example, is a beautiful and very comfortable all-weather wicker and eucalyptus smooth outdoor rocking chair for sale! It’s very affordable and perfect to create a set! 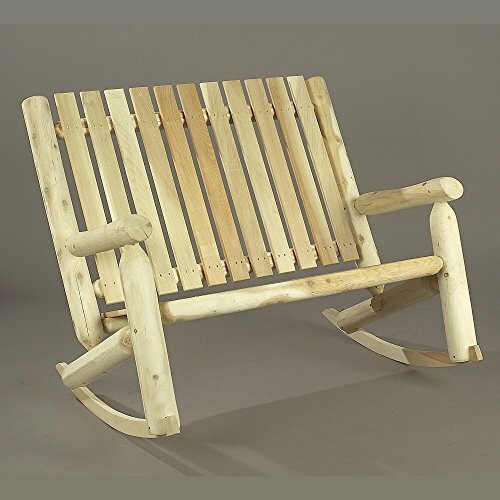 I decided to gather here all the high-quality best outdoor rocking chairs based on their looks, how comfortable they are and how happy their buyers are too! 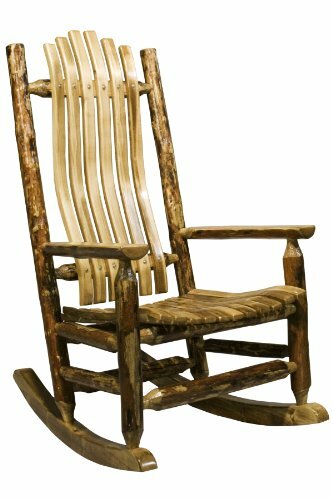 This is a very cute and very affordable popular log rocking chair for sale! It’s made from white cedar, which is a natural insect repellent and also weather resistant. As you can see it has a very ‘rustic’ look and it is very inviting! The price is excellent, so you can definitely create your own set and maybe add a cute wooden table between them too. It feels very solid and well-built! This is a stunning handcrafted country log rocking chair for the porch! It is very sturdy and very spacious! It takes about 20 minutes to assemble and it’s very comfortable too. 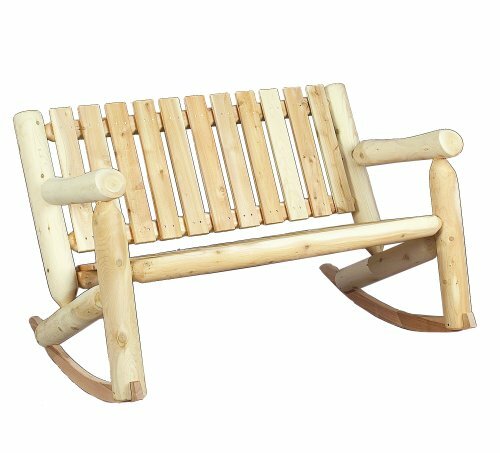 This gorgeous log rocker also has a nice ergonomic design, to ensure comfort on the back while sitting for longer periods of time. I love the wood color! *You can also get two and create a gorgeous set for your porch! 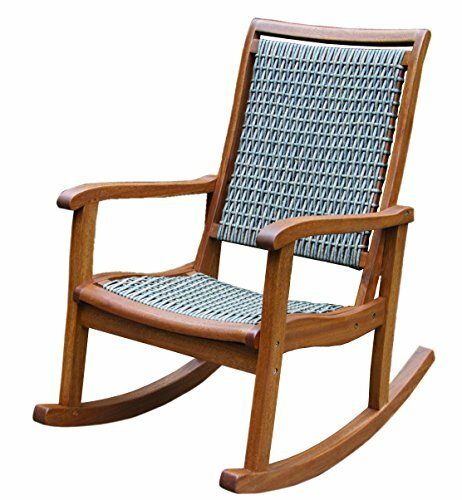 Beautiful Wooden Outdoor Double Rocker for Sale! 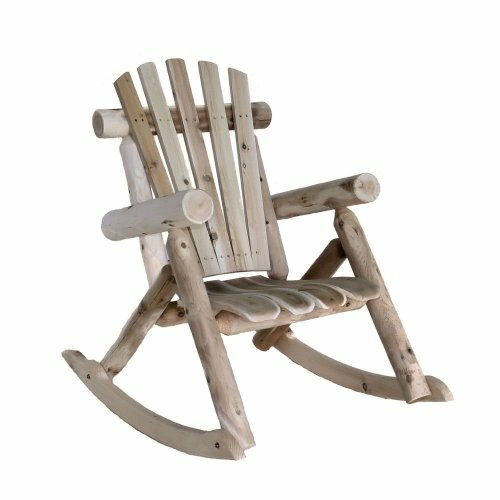 This is a beautiful and very affordable top-notch double wood rocker for the porch! The color is all natural and it’s made from solid cedar. It’s comfy, sturdy and great to relax with your husband! Another awesome wooden double rocker for sale! This one is a high back, which some people prefer because it provides a better back support. It is very elegant too! *It has a natural cedar color, but you can also paint it your favorite color. How about a cute iron double porch rocker? 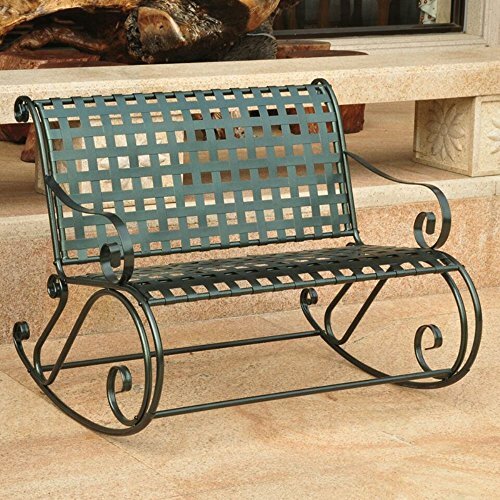 This is a very cute classic looking, affordable wrought iron double rocking chair for the porch! It is very sturdy and will definitely stand the test of time! Just add some cute and comfy cushions and pillows when you want to enjoy some fresh air outside! What a fabulous and very comfy set of two brown wicker porch rocking chairs with a cute round matching table! I am in love with this set! Comfy Rocking Chairs for the Porch! I had to show you this extremely cute and comfy, not to mention beautiful steel and wicker padded rocking chair set! They are also very sturdy! Very Cute RED Rocking Chair Set with Side Table! 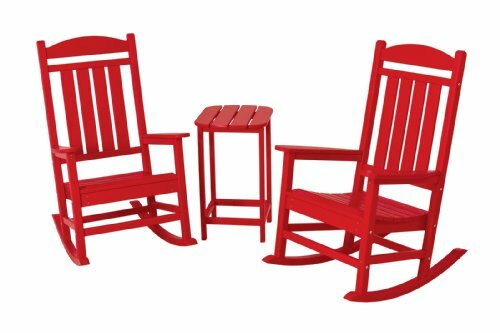 What a cute and cozy vibrant RED porch rocking chair set with a table! Isn’t it adorable? I am ALL about colors and red is always an awesome color to have anywhere in the home! Will immediately lift your mood! It comes fully assembled already and it was specially designed to support the back. 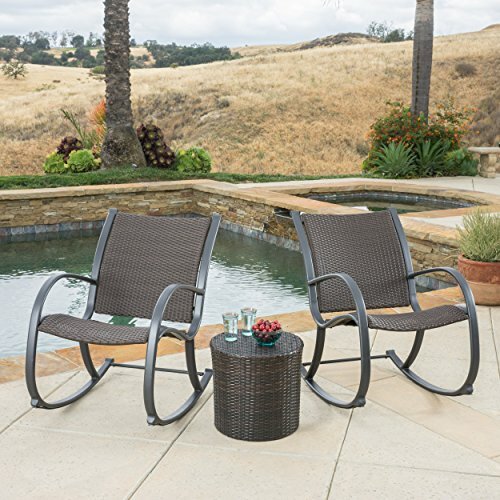 I am also a huge fan of outdoor wicker furniture because they are very resistant and look great! 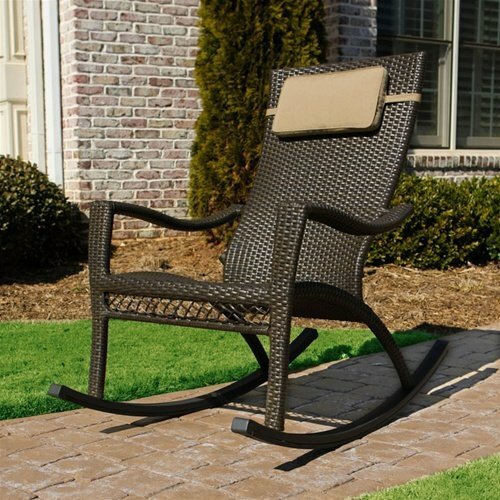 This is a gorgeous and very comfortable, dark brown wicker outdoor rocking chair for sale! It is also heavy-duty, UV resistant and can support people of up to 350 lbs. It has a double wicker weave and coated aluminum frames. I love this beautiful dark coffee color! *I hope you enjoyed my selections of rocking chairs for the porch! I’m back! 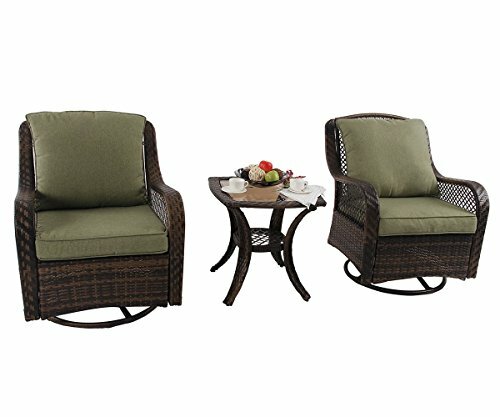 I need a recommendation for a outdoor porch rocker with great lumbar support, comfort, durability and weather proof…. Hi there again Donna! I personally like the last one, the wicker rocking chair, but the 3-piece ones, that come with a cute side table and cushions are also lovely! They are very comfy to relax and read a book.